Whispering over the water very hard to hear. Zach wonders If POV is used who will Devin put up. Derrick just hopes it’s not them. Brittany and Amber walk in the guys leave ..
Brittany telling her she doesn’t know how she’s going to get out of this situation she doesn’t think she can win the POV. They start looking around the house at some of the art Donny says he sees a deer, hogs nose.etc etc in the metal casting. 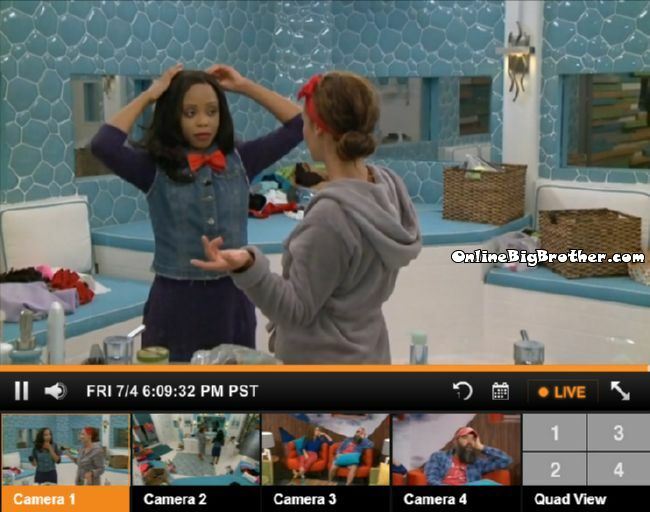 Brittany says Devin is retarded, he’s had 2 weeks to prove himself and he’s proved he’s an a$$hole. Brittany mentions how Devin is saying his reason to want her out is because of Joey. Brittany thinks that’s a weak reason. They agree Joey’s delivery was horrible. Brittany says she’s not sure what. Talking about how easy it is for them to fall asleep in the house. Donny tells them they’re a little hole near his bead and the wall where you can stick your belly and head in. It’s dark and you get fresh oxygen from the other side. Everyone laughs. Frankie says at him when he needs to sleep it takes. Devin says this was something he set up. Devin explains the deal was if he won POV he would use it on POW and put Victoria up. Devin doesn’t see anyone stirring the pot other than Brittany and Maybe POW later on. POWPOW – I’m not a weak player especially with the Mental stuff. 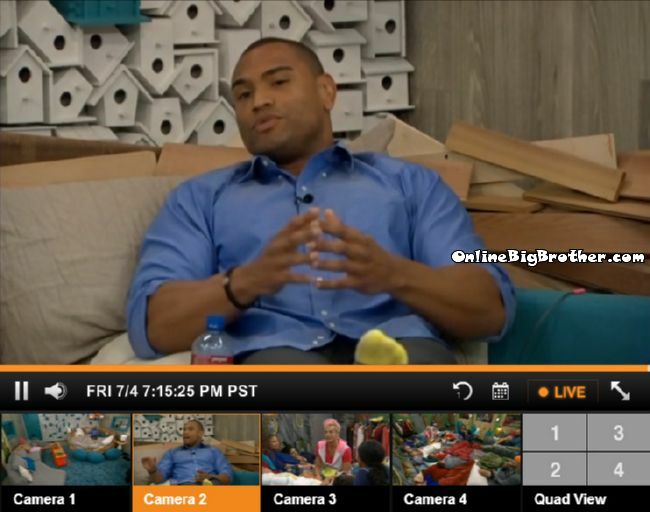 Devin tells him Brittany is the target if she wins POV Victoria is the target. Zach says he doesn’t care which one goes. Devin cares big time he doesn’t want POW to go. Zach starts talking loud about how they have the numbers even if America picks Noms. Devin says they don’t have the numbers if two bomb squads go up. Zach says his nominations speeches were perfect. Devin brings up promising POWPOW he will use the Veto. 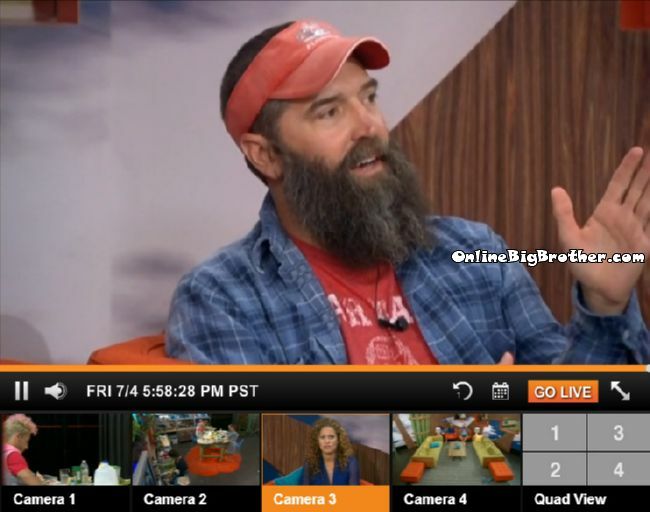 Zach – I hate victoria so her going next is wonderful in my eyes.. I’m just saying finish the mission so it doesn’t matter. Devin say britinay and Joey were the only girl that had the b@lls to do something. 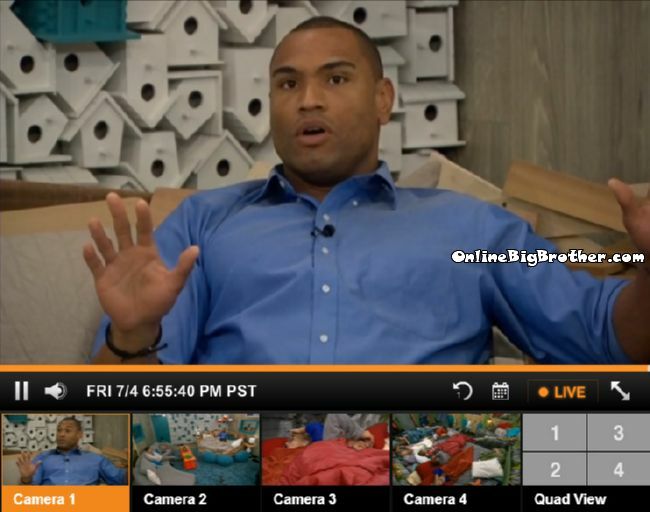 Devin says he wants Jocasta and Donny in the jury house. They both agree Hayden is a beast and is going to be hard to get out of the game. 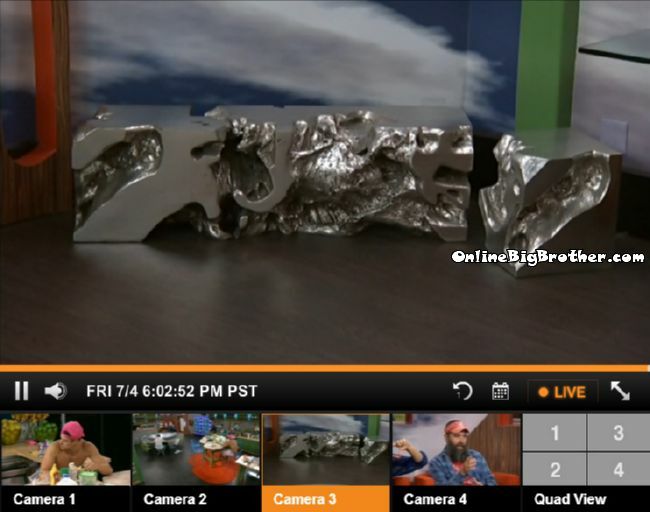 8:42pm Feeds are cut right now. probably a party. *****HAPPY JULY.4th*****Zach is an IDIOT!!!!!!! Devin really has a big mouth I dont hate him like most of you but did he really tell powpow she is the ultimate floater? This guy really needs to learn how to think before he speaks. He is wayyyy to comfortable. Does he not know how much of a sitting duck he is next week. He has to be a recruit because a true bb fan would know better. Ok Devin Caleb and Amber are in a 8 person alliance and are lying to the other houseguest to keep the alliance going while actually getting blood on their hands and they are evil. Zach Cody Frankie Derrick Christine are doing the same thing plus plotting ways to back stab their own alliance and they are seen as ok and given the title of being “good people”? Spot on. We know what that’s all about. I know, hey? His HOTitis hasn’t kicked crazy-in, like I thought it would, but oi, the talktalktalk. Devin says this, Devin says that. And the blue button-down with the classic “corporate hand” gesture pic up there is rich. As Bugs would say, “What a maroon”. I can’t wait for next week and he’s in the hot seat. @JonDow, you hit it on the head. Devin is a recruit. If he was a BB fan or even watched at least 3-4 seasons, he wouldn’t have such a big mouth and turn on people so quick. It would be one or the other. The thing about that guy is if you watched WWE during the attitude era, he’s a Rock clone. That’s why that guy cracks me up. The OJ comparison is way off, because this guy would be trying to bang everything and control if that were the case. Trust me, look at him like a Rock clone and you’ll be bustin up all night long. Those tears are fake, he turns it on when he even knows he overstepped. If this guy watched BB and learned from it, he would be the most dangerous player in the game. Britt don’t like him because she’s dated and boned guys like him in the past.lt shows. I think Devin will make the jury. But because America’s choice blew up in their face, you know CBS is gonna try and get Joey back in the game with some intel. They need to turn the paranoia level up a couple of notches, Hayden, Jocosta and Frankie are way too comfy right now. I think Nicole is a fake, She has a inner ho waiting to burst out. That goody girl act is growing tiresome. IF no cams were around, she would bang Cody and Hayden back to back. Okay, so let me get this straight.. Last week, Devin threatened each and every house guest that if the vote to evict Joey was not 13 – 0, he was going to come after them next. Fast forward to this week, and his opinion of Brittany is that she is a bad person because she did not vote to keep her friend Joey…………. I noticed the same thing. Also, last week he created an all-guys alliance (then randomly added 2 women) and freaked out at Joey for trying to do the same with an all girls alliance….I don’t understand how someone in big brother can get mad at someone *not in his alliance* for making her own alliance – that’s the whole point of the game. It’s 12:19 am on the east coast — Is everyone getting the Fish Bowl, and, “We’ll Be Right Back” with the Live Feeds? Someone please tell Brittany she should not use the word “RETARDED” in a derogatory manner….especially on TV. At any given moment, anything they do or say could be used on national TV. Disgusting and no better than Aryan last year.